This compound butter is tangy and slightly sweet, terrific on seasonal veggies, desserts, or breads. It's a terrific last minute homemade addition to a Thanksgiving or holiday meal. I couldn't decide if I should post this recipe for Thanksgiving, Thanksgivukkah, or Christmas meals, so I opted for the 'throw it up there the day before Thanksgiving and call it a last-minute homemade addition' strategy. If you're reading this in a turkey coma, I hope to give you ideas for upcoming meals or a reason to toss a bag of cranberries (on sale now, impossible to find later) into the freezer. The pretty pink color would look nice on a variety of tablescapes--Thanksgiving, Christmas, Valentine's day--tragically I am not a tablescape kind of person. I can cook the food. Don't rely on me to make it look pretty, too. So far (bearing in mind that I made this early so we could try it out and I could share today) we've enjoyed this lightly sweet, lightly tangy butter on waffles, pancakes, Cranberry Pecan Green Beans, sweet potato puree, Pumpkin Cranberry Maple Kugel, and fresh, hot sourdough bread. Yes, part of the reason to try it so many ways was because I'd made it, darn it, so now I needed to find a way to use it. I plan to try this on biscuits, muffins, and roasted acorn squash, and perhaps as a soup garnish. Other ideas? Since I am a visual learner, I made a video to show how simple it is to throw this together. Enjoy! Note: The amounts shown below are for a single stick of butter. If you want to do a whole pound (box), just quadruple the amounts. Also, the warmer the room you're softening the butter in, the better. Soft butter mixes best. Aim for 70 degrees Fahrenheit if you can. My room was in the 50s and it shows. 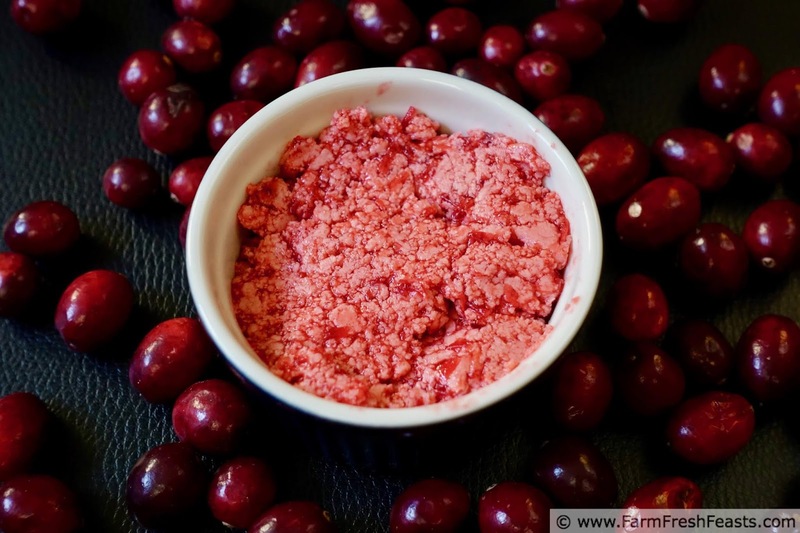 Place cranberries and water in a small saucepan. Bring to a boil, then reduce heat and simmer 10-15 minutes until the cranberries have popped. Drain (and save the cranberry juice to make syrup like in Marisa's book (link to Food In Jars website)without pressing down on the cranberries. Combine cooked, drained cranberries, butter, and honey in a food processor and pulse until thoroughly mixed. This butter keeps for a few months in the freezer. If you've got mad rolling skillz like Karly, roll them up into Pinterest-worthy rolls. Or you can do like I did and pack into ramekins to serve from at the table. Tablescape ability and rolling skillz . . . things I do not have. Things I do have? Yummy food in the fridge, freezer, and pantry; and plenty of folks to be thankful for this Thanksgiving. 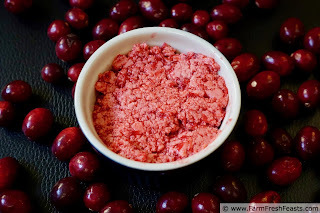 For more recipes using cranberries, please see my Cranberry Recipe collection. It's part of the Visual Recipe Index by Ingredient, a resource for folks like me eating from the farm share, the farmer's market, the garden, the neighbor's garden, and great deals on ugly produce at the grocery store. 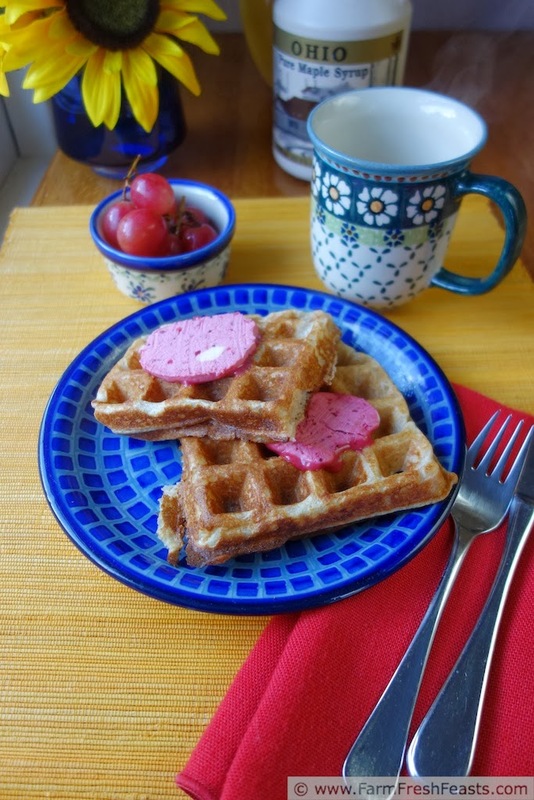 This makes me want to fire up the griddle and make some waffles! thanks for sharing! I'm of a mind to try it on biscuits next--as soon as I can convince my son to make some. Thanks for stopping by! Alright now I need to add cranberries to my grocery store list because I want to make this. I tried to add a bag to the cart a couple of weeks ago, and the Hubby said, "Now honey what are the cranberries for." I didn't have a good or quick response other than "I'll think of something." Well now I got something so I'm going back and getting the damned cranberries. I think this would be a great addition to crepes. Perhaps with sauteed spinach. I'll make a deal with you: you make the food and I'll come over and handle the presentation. In exchange I get to eat the food as well. If you make crepes with spinach and cranberry honey butter I will eat them, but I'll go on record now as saying I'm as suspicious as my kids look when I verbally offered that combo to them just now. I'd be delighted to let you handle the presentation--you rock at it! Oh, I am making some of this! 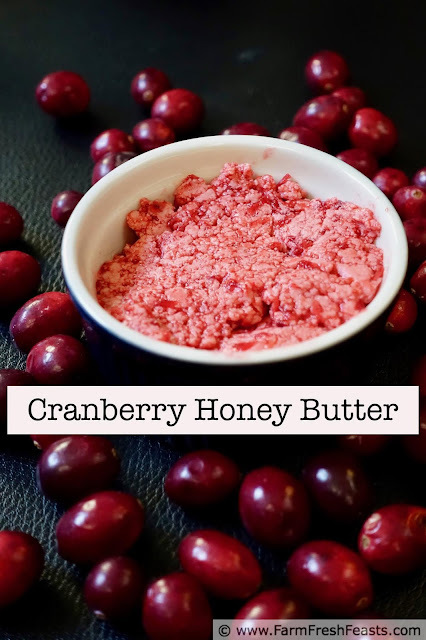 I love cranberries and the butter would be perfect on vanilla pancakes. I might add a little orange zest to the cranberries or the pancakes. Now the wheels are turning – already thinking of so many ways to use this. Thanks! Yes, yes, and yes! You're brilliant! What time is breakfast? Great recipe! Thanks for stopping by Tasty Tuesdays last week to link this up. I chose it as one of my feature recipes for the week! Have a great week and see you at Tasty Tuesdays again soon! Thank you for the feature--it's much appreciated! This would be great on biscuits!! I will definitely have to keep this in mind... and get some more cranberries! I have to get more cranberries, too! Adding to my shopping list. Thanks for the reminder. Gorgeous color! Dresses those waffles right up. A perfect treat for this time of year. Sometimes my waffles just like to accessorize, you know? Thanks!